Managing Costs and Profits and making decisions on order quantities: How are these two ideas connected? In many businesses, planners base their order replenishment quantities on industry rules, category codes, or ABC analysis. 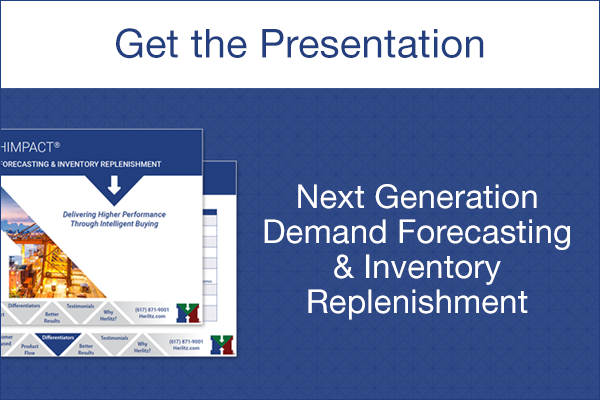 Often the regular replenishment order cycles are based on traditions, norms, or general rules. You should be looking at the economics involved: weighing the cost structure in your business, the vendor product costs and price bracket information. Can you determine if you are making sound business decisions? Are your order cycles determined by rule of thumb? Weekly or Bi-weekly? When does buying higher volume vendors in truckload quantities make financial sense? You should be buying in quantities that maximize profitability. HIMPACT’s Order Policy Analysis provides you the tools to make better buying decisions by balancing handling and carrying costs while considering the economies of scale. Order Policy Analysis increases your profits by calculating the most economical way for you to buy, improving the flow of inventory into your DC and stores, minimizing costs and identifying the most profitable order quantities. Viewing the Costs and Profit graphs, you can easily identify what Order Cycle makes the most sense for your business. Order Policy Analysis simulates the costs of handling vs carrying for each vendor, based on order sizes varying from 1 to 365 days of demand. It recommends the “Best Order Cycle” of 9 Days (top right corner). But a 9 day order cycle doesn’t reach the Vendor bracket minimum of 39,000 pounds required for optimizing freight or receiving TL pricing. The simulation identifies what affect this constraint has on the order cycle and overall profitability. In this case the buyer will select a 12 day order cycle to reach the Truckload bracket minimum, increasing annual carrying costs slightly, by $388 or 3.8%. Our order policy management solution helps you maintain your service goals providing the highest possible profits on an item-by-item basis, pleasing your customers while maximizing bottom-line results. If you are controlling your inbound freight utilizing a 3PL, we can use that information in identifying the most profitable quantities for your buying.